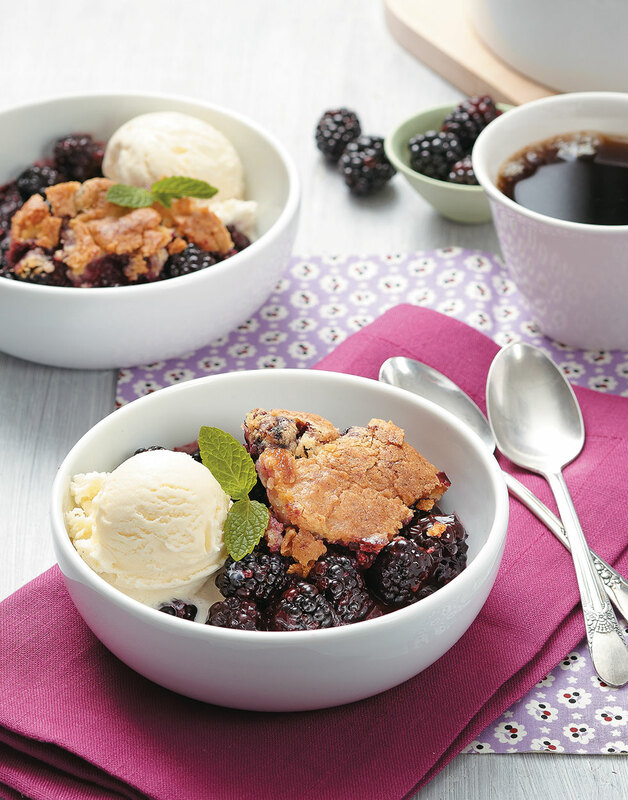 Fresh blackberries make the best filling, especially since they're in peak season when you'll most want this fruity cobbler. But frozen berries are an option, too. For the filling, toss together berries, ¾ cup sugar, tapioca, ½ tsp. salt, and orange juice in a large bowl. Transfer berry mixture to a 2½-qt. rectangular or oval baking dish (about 2-inches deep). For the topping, combine flour, baking powder, and ¼ tsp. salt in a small bowl. Cream butter and 1 cup sugar in a large bowl with a hand mixer on medium speed until light and fluffy, 3–5 minutes. Add eggs, vanilla, and zest; beat on medium speed until combined, then beat in flour mixture until a moist dough forms. Spoon dough over berries. Bake cobbler until juices are thick and bubbly and topping is golden brown, about 1¼ hours. Let cobbler cool on a rack at least 1 hour. Serve cobbler with ice cream and garnish with mint, if desired. Gently stir the filling together to evenly distribute the tapioca without damaging the berries. Spoon and gently spread the dough over the berries. It will be thin in spots, but it spreads as it bakes.